After you’ve described your bank account(s), you’re ready to start using Quicken 2012. With Quicken, the key thing you want to do is track your bank account or accounts so you can monitor and measure your income and your outgo. And so that you know how much money you have in an account. The folks at Intuit, however, allow you to provide the Quicken program with a lot more information about your financial affairs. Specifically, the Intuit gang let you describe in detail your income sources and your regular expenditures. To tell Quicken all about your income and outgo, click the Get Started button in the Stay On Top Of Monthly Bills area of the home page. 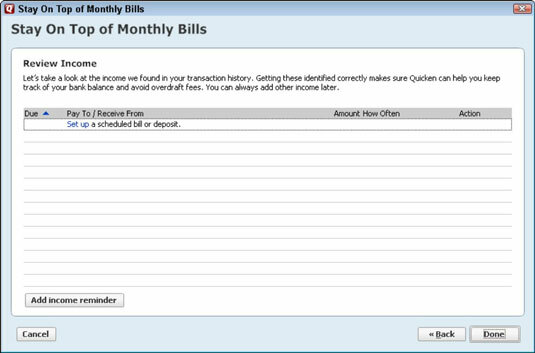 When you do, Quicken displays the first Stay On Top Of Monthly Bills window. To describe a recurring bill (like your rent check, car loan payment, and so on), you click the Add A Bill button. Then, when Quicken displays the Add Bill Reminder dialog box (not shown), you describe the bill in detail, including who gets paid, when they should be paid, why they’re paid, and so forth. If you click the Next button shown in the bottom-right corner of the Stay On Top Of Monthly Bills window, Quicken displays a second version of the Stay On Top Of Monthly Bills window. The second version of the Stay On Top Of Monthly Bills window provides an Add Income Reminder button. To provide information about your income to Quicken, click the Add Income Reminder button. Quicken displays dialog boxes that ask for the gory details.